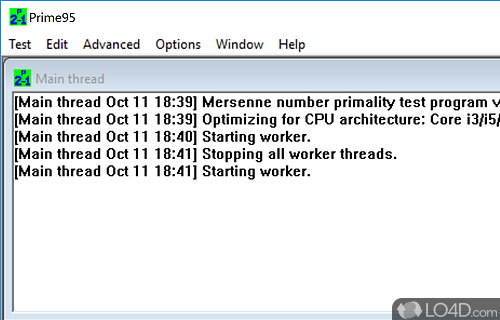 Prime95 is a freeware prime number app filed under benchmark software and made available by Mersenne Research for Windows. The review for Prime95 has not been completed yet, but it was tested by an editor here on a PC. If you would like to submit a review of this software download, we welcome your input and encourage you to submit us something! Prime95 is a program which searches for very large prime numbers. It has become extremely popular among PC enthusiasts and overclockers as a stability testing utility. 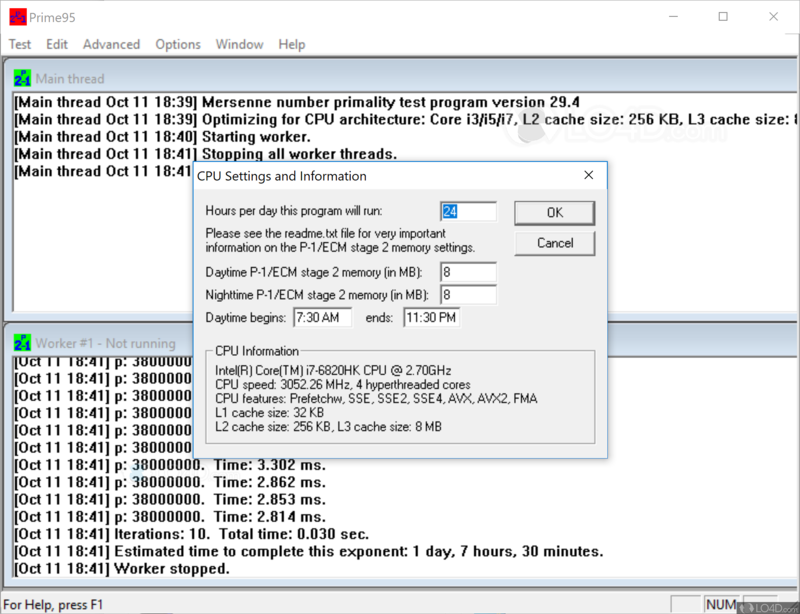 It includes a "Torture Test" mode designed specifically for testing PC subsystems for errors in order to help ensure the correct operation of Prime95 on that system, but can also be used to stress test a PC. People who are overclocking their system may use the torture test as an indication of the stability of their system. If your computer can run Prime95 for 24 hours without any errors, then you can usually assume that your CPU, and the parts of the motherboard which interface with the CPU and RAM, are stable and working well. Prime95 is licensed as freeware for the Windows (32-bit and 64-bit) operating system / platform from benchmark software without restrictions. Prime95 29.8 is available to all software users as a free download (Freeware). Compatibility with this prime number software may vary, but will generally run fine under Microsoft Windows 10, 8, 8.1, 7, Vista and XP on either a 32-bit or 64-bit setup. 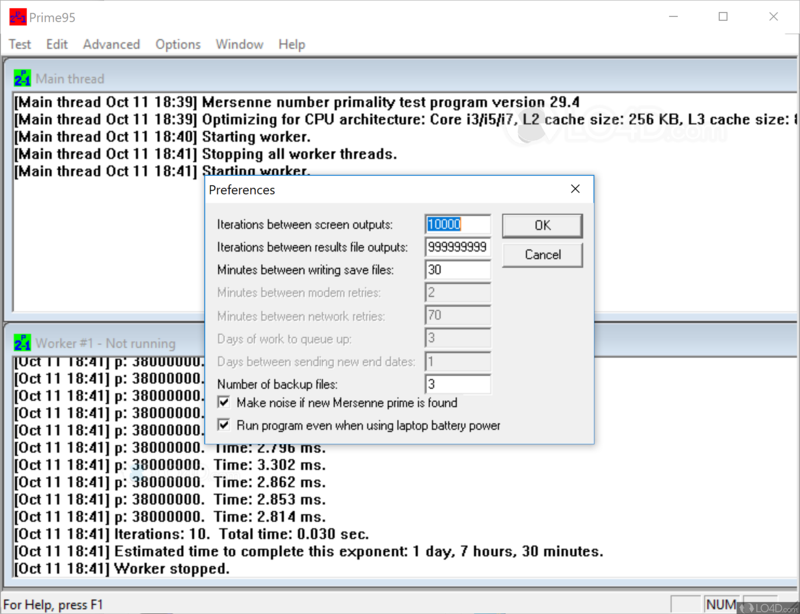 A separate x64 version may be available from Mersenne Research. This download is distributed as p95v297b1.win32.zip and p95v297b1.win64.zip. We have tested Prime95 29.8 against malware with several different programs. We certify that this program is clean of viruses, malware and trojans. 4.2 out of 5 based on 13 ratings.